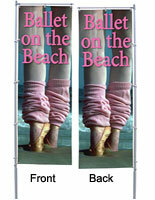 These portable advertising displays include 2-sided full color custom graphics on knitted polyester fabric flags. Designed for indoor or outdoor use, these branded flag systems offer high visibility in any location. 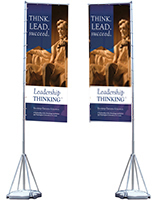 These advertising displays with a 13' TriPole stand are easily seen on both sides as two digitally printed pennants are sewn together for right-reading advertisements on either side. 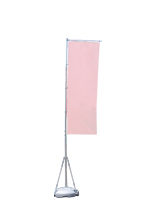 Each of these tall flag systems is easy to put together and take apart, making them ideal for off-site or seasonal marketing campaigns. These fillable base fixtures have collapsible aluminum poles for compact storage and easy transport, and include a hollow plastic base that can be filled with up to 11 gallons of sand or water for maximum stability in public areas. Each advertising display comes with convenient carry bags for transportation and storage. 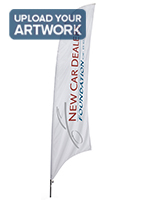 This type of high visibility double-sided banner fixture is ideal for use at outside sales events, trade shows, festivals, concerts, or outdoor promotional fairs and expos. 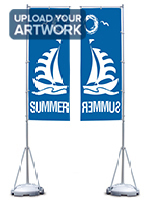 Each of these aluminum flagpole systems is easily to set up by simply locking the pole segments in place. The specially designed flag arm bracket is designed to sivel easily, allowing it to withstand windy conditions without impacting visibility. The tripod base support offers maximum stability, and the base can be filled with sand or water for additional security in windy weather or heavy foot traffic in public venues. These digitally printed displays with right-reading graphics on both sides offer full-color photographic-quality graphics reproduction for logos or brand messaging. The durable knit polyester fabric is designed to withstand heavy use without fraying and fading.